On September 7, 2010, I was riding my motorcycle with friends in South Jersey when my front tire hit something in the road. I lost control, crashing into the cement barrier. I was transported to Crozier Hospital and then helicoptered to Jefferson Hospital with a spinal cord injury at the T12-L1 level, no feeling or movement below my knees. They placed a rod with six screws in my back and a rod in my right tibia. I arrived at Magee a few weeks later for more than a month of rehab, then I returned in January 2011 for more physical therapy, celebrating my 21st birthday (along with my twin sister, Katie) at Magee. I came home in February 2011 and started Day Rehab at Magee Riverfront, transitioning to outpatient therapy twice weekly. At the time of my accident, I had just started my second year studying Criminal Justice at Camden County College. In an instant, all my mental and physical strength was concentrated on rehab. I was 6 feet tall and 175 lbs. and after my accident, I dropped down to 125 lbs., looking very thin and boney. Slowly, I gained weight and got stronger and more independent. I redid my driver’s license for hand control driving and began to think about my future. Before my accident, I was a very physically active person, doing things with my Ford F-150 truck. I now drive a 2006 Chevrolet SS Trailblazer with hand controls. Magee helped me learn how to transfer properly, getting in and out of cars, and to become independent. I am even able to pull myself up in my buddies’ big trucks. In Fall 2012, once I felt like I was stable, I decided to go back to Camden County College to finish my Associate’s degree. In the beginning, it was pretty scary. Your mind races through countless situations wondering how you are going to cope. What if I have to go to the bathroom: where are the handicapped bathrooms? Where is the elevator? Can I transfer to the molded desk unit or stay in my wheelchair? During this time, I learned to ask for help and to speak up. I had to ask the college for a table so that I didn’t have to hold my notebook in my lap trying to write notes. I could not transfer into the classroom desks. I was able to find that bathroom at the end of the hall that accommodated me (and was not dirty.) There were many times that I had to advise the maintenance staff that the stall door should swing out and not in (they just needed to change the lock.) When wheeling myself from building to building, I needed to let people know that I was coming up a ramp and I would appreciate it if they let me pass. I got to be friendly with the campus security and was able to get permission to park in administrative parking spots if there were no handicapped spots available. In the winter, I advised my professors that if there was a snowstorm approaching or snow that had not been plowed, I would not be in class that day. The parking lots might be plowed, but the snow embankments would prohibit you from wheeling your wheelchair from the car to the sidewalk. Most times, a path is not shoveled enough. Professors understood. Fellow students in the classroom were helpful by moving desks out of the way so that I could get down the aisle. After obtaining my Associate’s degree in Criminal Justice in May 2015, I wasn’t sure what I wanted to do. I took a year off, and I realized that I could not become a police officer in the typical way, which had been my original plan. I did take a NJ health insurance course and applied to a couple of job openings, but I realized that most of the open positions required a Bachelor’s degree, so I looked into transferring to Rutgers University in Camden, NJ. My twin sister had just transferred to Rutgers the semester before, so we would be on the same campus. So I began at Rutgers in the Fall of 2016 in the Criminal Justice program. Most of my credits were transferable. I decided to take the PATCO train from Lindenwold, NJ to Camden, NJ to Rutgers University. The Rutgers stop is at “City Hall” station, but since that station did not have an elevator, I had to get off at “Broadway” and would call Rutgers University security for an accessible minivan to drop me off at my first class. At the end of the day, the shuttle would take me back to the “Broadway” station. While at Rutgers, again I got to know my professors and advise them of my possible absence in bad weather and my classroom modifications. I felt more confident anticipating my needs, and Rutgers was very accommodating. It has been a long journey, and I finally graduated on May 16, 2018 with a Bachelor’s of Arts in Criminal Justice from Rutgers University. I feel very satisfied and very fortunate that I had many people along the way give me support and encouragement to continue on, both physically and mentally. My advice to anyone else after an injury would be challenge yourself, even if it might be something small, and do not be afraid to try. 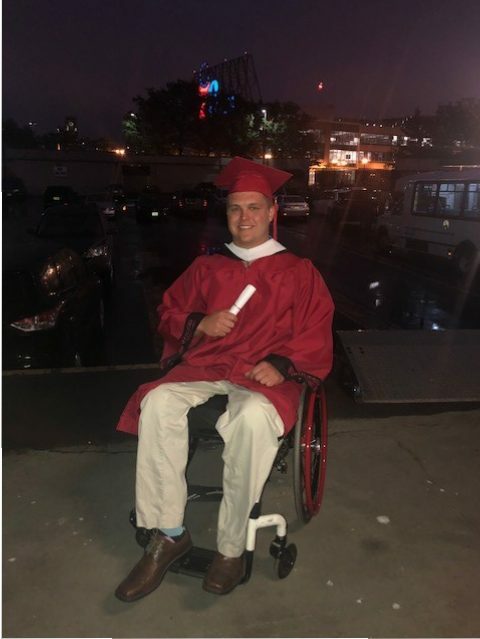 Through my journey, I am still challenging myself by riding a quad, kayaking, jet skiing, swimming, adaptive surfing, snow plowing in the winter (I put a plow on an old truck,) and now finding full time employment. Who knows where I might end up? I am also very appreciative from the support, guidance (thanks to counselor Vilma Mazziol,) and training I received at Magee and from the Adam Taliaferro Foundation. To learn more about Adolescent and Young Adult programs at Magee, click here.